Wondering what schools are doing today to prepare students to be competitive in the new global economy? Ninety Endeavour students gathered in the Tobin James vineyard to test their hypotheses regarding various aspects of atmospheric pressure. The students had been free to choose their own experiments, design their gondolas and choose the equipment they thought would be needed to gather the information which would prove or disprove their hypotheses. With a huge storm promised, plans had to be altered, but launching the balloons proceeded as planned. 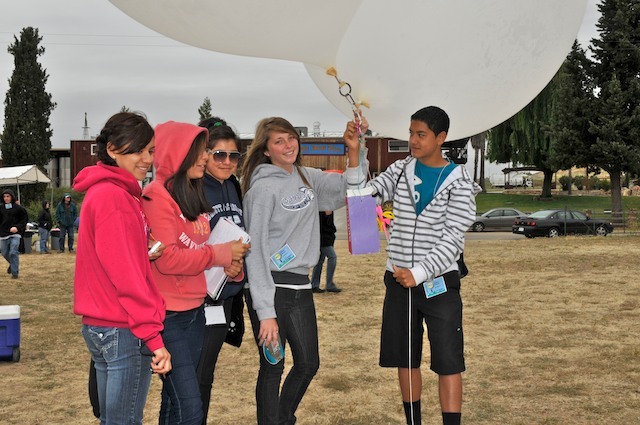 Students filled tethered experimental balloons with helium to support their gondolas, launched them and kept them in the air to gather their data. Mentors for each team were present to discuss solutions for problems encountered during the hour or so the balloons were in the air. When they had gathered their data, the teams meet with their mentors to analyze the data, and prepare Power Point Presentations to present their conclusions to the parents, scientists, teachers, and other mentors and students. Endeavour Instructors stress that student experiments are successful as long as the students recognize that an experiment must either prove or disprove their hypothesis. This focus is a central tenet of STEM education which emphasizes that the ability to use critical thinking and problem solving is more important than getting a predetermined correct answer. The following people have made this event possible: Claire and Lance Silver of Tobin James Cellars who host the event; Drs. Hartmut Sadrozinski and Terry Schalk of the SCIPP Institute at UC, Santa Cruz who have provided mentors and support; Quarknet at FermiLab (Batavia, Illinois) which arranged funding from the National Science Foundation; and many professors, researchers, and students at UCSC, Stanford, and Cal Poly who are mentoring the students. For more information: Visit the Endeavour Balloon Fest website at: http://endeavours.org/Events/BalloonFest2011, click on “experiments” for details about the student teams.Click on “schedule of events” for a timetable.